It’s the year-around treat that everyone loves, producing more smiles per capita than any other product in the United States (we may have made that statistic up). You might have wondered where ice cream came from, how much ice cream Americans consume each year, and how to get rid of that pesky brain freeze. We’ve got the facts you need to share with your friends and family when you’re crowding up at an ice cream counter next time. Here are seven facts you might not expect about this delectable, sweet treat. 1. Americans Eat 20 Quarts a Year Each! It doesn’t seem like it when you’re biting into each and every delectable scoop, but on average, Americans eat about twenty quarts of ice cream per year! That’s a lot of sweet bites, fun times, and satisfied smiles for people all across the country. Just to reiterate that Americans consume a LOT of ice cream, we just want to let you know that the amount of ice cream that was consumed in 2011 was 1.53 BILLION gallons of ice cream. That’s BILLION, with a “B”. 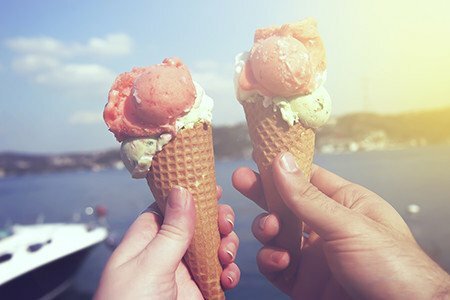 Ice cream is by far the most popular dessert in the United States. That’s more ice cream than we would know what to do with (although, if we were challenged, we bet we could eat it). When you’re at your local ice cream shop, have you ever wondered where the ice cream cone came from? The first thing that made ice cream portable (before our Mochi rice dough revolutionized the process at the inception of our history) was the ice cream cone, created by an Italian New Yorker who wanted to make the ice cream experience a treat that you can walk around with. The absolute last thing that Elvis Presley ate was ice cream, making us like The King even more! Scooped in Italy, the tallest ice cream cone that was ever scooped came to us from Italy, reaching an astonishing nine feet tall, impressing the entire world. Maybe this one doesn’t come as a surprise, but vanilla as an ice cream flavor is the most widely consumed. Although plain to some, vanilla still reigns supreme as the most widely liked and consumed flavor in the world. Did you know that if that cold, cold ice cream didn’t reach the roof of your mouth, you wouldn’t experience any brain freeze at all? That’s a little tip for the next time you’re wolfing down a bowl (or a rice ball!) of ice cream. Slow down a bit and try not to let the ice cream touch the roof of your mouth so much. You’ll be glad that you did.